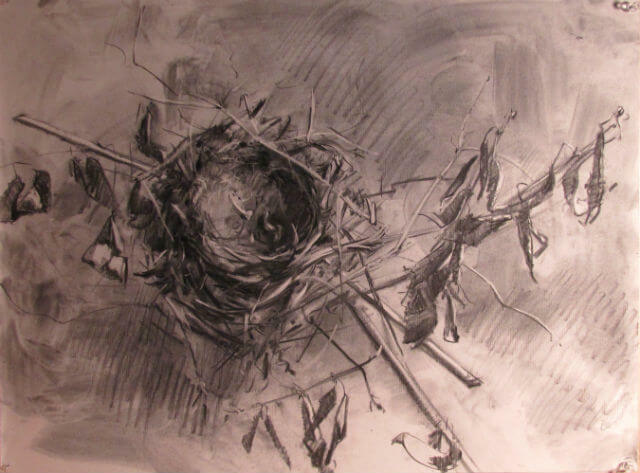 This week, I have been working on a drawing of a nest. It is no ordinary nest although it was built by a common catbird. But this catbird, I have come to know as it returns every year to my yard to raise its young. It has built a nest in the pine, the ash tree and for the last two years in my forsythia bush. This year’s nest is quite beautiful. It is roundish with an extensive array of various twigs. Some are as fine as human hair while others are rough and prickly like a pine branch. There is a beautiful arrangement of strips of bark, paper thin, curled and wispy undulating around the circumference. There are arching sticks that could not be curved by the body of the bird and they hang separate yet integrated. They caught her eye during the gathering and embellish and compliment the nest. There is even a single maple seed, held like a coveted jewel lying where she herself sat. It is a beautiful, well-crafted vessel to ride the summer breezes-a place of refuge, a home. It is interesting to meditate on the objects one chooses to draw or paint, to look for those significances that lie in front of us. In Bachelard’s, The Poetics of Space, he describes the “living” nest, “…it is living nests…, the nest found in natural surroundings, which becomes for a moment the center- the term is no exaggeration- of an entire universe, the evidence of a cosmic situation.” (Gaston Bachelard, The Poetics of Space, p.94) A nest is a bird’s house. I’ve known it since I was a child. Yet, it holds something within itself that is extraordinary. As a child, I loved to discover a hidden nest, to peer inside and to see if there were any eggs and what color they were. It felt like a separate world yet one that I was intimately connected to. How can such a little thing like a bird build something that would sustain the elements, allow the young to thrive, protected and safe? When I look at my nest now, I am so careful with it. It seems so fragile. I try not to jostle it so I will not lose any of the twigs. How did this fragile home, so precarious amid the branches of the bush, survive until the fall, until the leaves revealed its placement? It is important when one looks at an object, paints that object, that one reveals the depth and intimacy that resides there. It is why Van Gogh’s paintings of nests are so beautiful. He relates the nest to the many peasant cottages he painted. He wrote to his brother, Theo, “The cottage, with its thatched roof, made me think of a wren’s nest.” (Van Gogh, Letters to Theo, p.12) “For a painter, it is probably twice as interesting if, while painting a nest, he dreams of a cottage and, while painting a cottage he dreams of a nest…For the simplest image is doubled; it is itself and something else than itself.” (Bachelard, p.98) Isn’t this the real task at hand- to carefully paint what is before you while revealing in the process its deeper underlying significance? I love your drawing of the nest. It is so well observed and composed. Love how the branches around it lead my eye to it and the sence of scale and location in space they give it and the way you handeled the backround. It certinley is no ordinary nest. It is very dramatic, profound, the eternal nest.